The total number of fentanyl-related deaths in Alberta was 330 as of June 30. This is up from the same period last year where 247 people died. 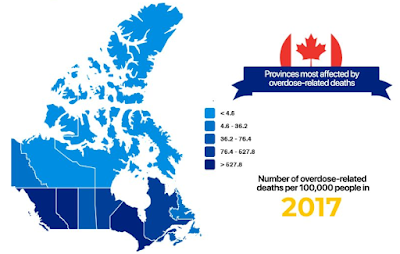 On average, two die every day in Alberta as a result of an opioid overdose. In B.C. more than 105 people died in June bringing the 2018 total so far to 742. That’s on track to match 2017’s record total of 1,451. March 2018 was the worst month ever in British Columbia with 162 fatal overdoses. Since B.C. declared a medical emergency in April 2016, B.C. Coroners Service figures show 2,895 people have died.